The quality, regulatory, safety, and commercial compliance management areas are quite often looked at as organizational necessities rather than value-added functions. They also are areas that sometimes lack innovation and transformation. In a recent global survey of pharmaceutical CEOs, regulatory concerns continue to be viewed as a threat to growth. In fact, since 2013, these concerns, collectively, are among the top three threats as reported by pharma executives (PWC’s 20th Annual Global Pharma CEO Survey). Lack of innovative technology and harmonization: Clients quite often are dealing with aging technology, multiple platforms for the same purpose, and lack of automation. Access to global and local domain expertise: Being able to leverage local expertise is critical to maintaining best practices and reducing risk. Staying abreast of ever-changing global and local regulations: To gain an initial understanding globally is a tremendous effort; yet, it’s critical to keep up to date as adapting to regulatory changes by country and region can be an even greater resource drain. Multiple silos/vendors/manual processes: There is a lack of horizontal integration, numerous vendors to manage, and inefficiencies due to lack of automation – which add to duplicative spending and lack of internal cost transparency. Reliance on extensive internal resources in several of these areas further hinders compliance. High volumes of unstructured data complicates downstream reporting and can delay the real-time insights required to maintain compliance. When comparing what the market actually requires in the compliance space versus what the market currently offers, one begins to see drastic differences. First, a life science company ideally wants a partner that has deep domain expertise, but the market is impacted by a multitude of disparate compliance requirements across the pharmaceutical product lifecycle globally. Another optimal requirement is a partner that has expertise at the local level but with global scale, yet when you look at the market, there are mostly point solutions that don’t focus on providing a true end-to-end approach. Probably the biggest shortcoming in the market is the amount of aged and disconnected technology, or the number of processes that have not been automated. Efficiency gains through innovative technology are a must in order to transform compliance to an area that adds value to an organization. On the reporting side, any latency or shortcoming in reporting just adds to the complexity and potential delays in meeting regulatory requirements. Lastly, multiple point solutions and internal vertical silos result in inefficient operations and duplicative spending. To avoid this, clients are looking for more of a horizontal approach and a partner that can service complex organizations. 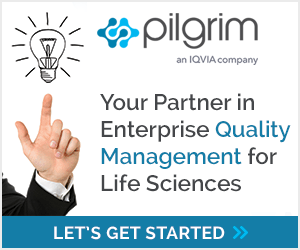 So why is IQVIA doubling down in the quality, regulatory, safety, and commercial compliance market? First and foremost, because these factors matter to making medicines and devices that are safe, ensuring these valuable products remain available, and ensuring that companies are trusted in the public eye. The risks of non-compliance are too great. The dangers range from compromised patient safety; delays in product approvals or denials; license withdrawals; financial penalties; and in the worst case, criminal penalties. These adverse circumstances can be devastating to a life science company, not to mention the negative public perception that any of these risks bring. This life science market currently is under-served by solutions that enable its players to circumvent these dangers, however IQVIA’s breadth and depth of solutions can help reduce these risks. IQVIA helps its clients navigate the complexities around compliance by tapping into the IQVIA CORE. Domain expertise – in all compliance verticals, IQVIA has the subject matter expertise to understand the requirements, can assess its clients’ level of compliance with requirements, and can design and implement solutions. In all compliance verticals, IQVIA has industry leading technology that either enables its solutions and managed services and/or that it provides to its clients for them to manage compliance operations. From a data perspective, IQVIA has the largest global regulatory information database. Country-by-country regulatory requirements in multiple regulatory domains are maintained and kept up-to-date as they change. Clients use this information to stay abreast of changes, and IQVIA utilizes this information to ensure that its technology and solutions remain aligned with regulatory requirements. With respect to analytics, all of IQVIA’s compliance verticals provide the actionable insights required to make better proactive decisions and provide clients with a holistic, horizontal view of compliance as well. IQVIA is well-positioned to support its customers, in both the biopharmaceutical and medtech industries, from research to commercialization across all compliance disciplines. It has accomplished this through aligning its leading solutions and services across the organization, as well as making significant investments internally and externally over the past 18 months. What does IQVIA have in store for the future of compliance management? The company will continue to invest in order to help its customers accomplish these 3 goals: Simplify, Integrate, and Transform. Not all organizations will leverage IQVIA’s end-to-end solutions as a complete package. However, those that do engage IQVIA’s one suite of horizontally integrated solutions will gain efficiencies through reducing the number of vendors, reducing the number of technology platforms, leveraging a single point of accountability, and in the end, will benefit from lower total cost of compliance. IQVIA is helping customers transform the compliance market through innovation, and through close working relationships with its customers as true partners, to further extend the value compliance adds to an organization. Solutions and platform designed for transformation. SmartSolve Platform for Compliance provides a powerful foundation for building a mature quality system.